The Windsor Spitfires gave them all they could handle, but the Niagara IceDogs claimed a 4-3 road win to kickstart #OHLDay on Sunday. Jake McGrath made 32 saves behind goals from Bradey Johnson (9), Jason Robertson (34), Oliver Castleman (13) and Philip Tomasino (24) as Niagara defeated Windsor despite being outshot 35-25. Jack Studnicka and Johnathon Schaefer both had two assists as Niagara won a sixth straight, improving to 30-10-7-0. Cole Purboo (23), Curtis Douglas (19) and Daniel D’Amico (20) scored for the Spitfires as they lost their fifth straight, falling to 20-26-2-1. Luke Burghardt (2, 3) scored twice and added an assist and goaltender Christian Propp stopped all 26 shots he faced as the North Bay Battalion blanked visiting Kingston 4-0. Matthew Struthers assisted on all four North Bay goals as the Troops outshot the Frontenacs 43-26. Kingston was shutout for a second straight game and has scored just three times over the past five contests. While the Frontenacs are 12-35-1-0 after their fifth straight loss, North Bay improves to 23-22-1-2. The Sarnia Sting capped-off #OHLDay with an eight-goal effort as captain Ryan McGregor (17, 18) had two goals and an assist in an 8-4 win over visiting Hamilton. Sarnia climbed out to a 5-0 lead early in the second period before Hamilton eventually pulled back to within two goals down 6-4 midway through the third. Hugo Leufvenius (27) and Jacob Perreault (23) put things out of reach with third period markers as Sarnia ended a three-game drought. Brayden Guy (14, 15) also scored twice while Mitch Eliot (12) and Curtis Egert (11) added singles while Marko Jakovljevic, Sean Josling and Franco Sproviero each had two assists. Jan Jenik (2) and Logan Morrison (6) scored for Hamilton before NHL Draft prospect Arthur Kaliyev (34, 35) scored a pair in the third period. The visiting Bulldogs went 3-for-7 on the power play but fall to 23-22-3-1 on the campaign. Sarnia improves to 20-22-5-2. Greg Meireles (22) tied the score at three with 2:44 remaining in the third period before Jonathan Yantsis (34) scored the overtime winner on a beautiful feed from Rickard Hugg 1:29 into the extra frame, giving the Kitchener Rangers a 4-3 road win in Sault Ste. Marie. Joseph Garreffa (14) and Mike Petizian (3) also scored for the Blueshirts while Hugg finished the game with three assists. Kitchener outshot Sault Ste. Marie 33-23, going 2-for-7 on the power play as the Rangers rebounded from a 7-2 Friday night loss at home to Flint. Rory Kerins (6), Ryan O’Rourke (7) and Mac Hollowell (16) accounted for Greyhounds goals while Barrett Hayton finished with two assists. Kitchener sits fourth in the Midwest Division with a 21-22-3-0 record while Sault Ste. Marie sees a seven-game winning streak snapped, sitting first in the West with a 31-10-5-1 record. The loss is Sault Ste. Marie’s first on home ice since Dec. 28th. Ukko-Pekka Luukkonen turned aside 40 shots as the Sudbury Wolves snuck out of Mississauga with a 2-1 win. Down 1-0 for most of the game, Sudbury got third period goals from Nolan Hutcheson (15) and Adam Ruzicka (18) while Luukkonen took care of the rest. Steelheads rookie Joe Ranger was also impressive, making 36 saves in the loss as Cole Schwindt (13) scored the lone goal for the Trout. Mississauga failed to earn a point for the first time in six games, falling to 22-20-5-1 while Sudbury earned a third straight win, improving to 28-16-2-1. Sudbury has won four of six against Mississauga this season. Down 3-2 early in the third, Josh Nelson (14), Cole Tymkin (19) and Liam Foudy (24, 25) all scored to propel the London Knights past host Oshawa 5-3. Foudy finished with two goals and an assist while Connor McMichael (29) also scored for the Knights who earned their third straight win. Kevin Hancock also had a pair of assists while Knights goaltender Joseph Raaymakers made 26 saves. 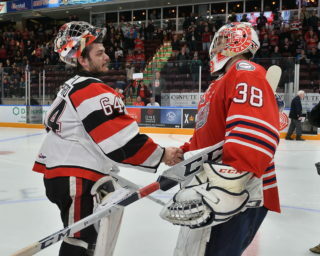 London outshot Oshawa 45-29 as Generals netminder Kyle Keyser turned in a 40-save performance. 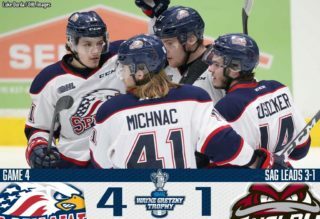 Allan McShane (20), Nicolas Mattinen (15) and Anthony Salinitri (37) were goal-scorers for Oshawa as Salinitri earned first star honours with a goal and two assists. The Knights hold a 13-point lead atop the Midwest Division with a 33-7-5-1 record. Oshawa drops a third straight decision and sits second in the East Division with a 28-18-2-0 record. 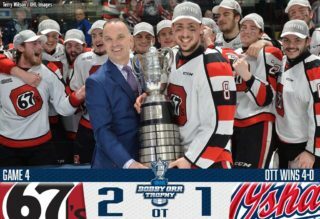 The Ottawa 67’s exploded for four goals in the first half of the third period, sprinting past the visiting Saginaw Spirit 5-3. Lucas Chiodo (21) struck near the end of the first period to make the score 1-1 before Tye Felhaber (51), Sasha Chmelevski (15), Mitchell Hoelscher (9) and Marco Rossi (21) also tallied. 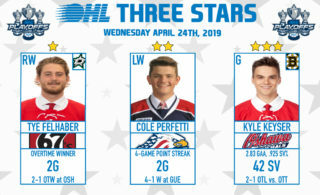 Kyle Maksimovich earned two assists in his 300th career OHL contest while Cedrick Andree made his second straight start, turning aside 33 shots for the win. Damien Giroux (19), Ryan McLeod (15) and Cole Coskey (27) scored for the Spirit as their five-game winning streak was snapped. Ottawa has now won five straight, improving to 35-9-3-1 for a seven point lead atop the Eastern Conference. Saginaw sits four points back of first place Sault Ste. Marie in the West Division, owning a 30-13-2-2 record.